Meet Kevin Smokler, the “unofficial educator in residence” for the San Francisco Writers Conference. Kevin Smokler is the author of 3 books, including most recently Brat Pack America: A Love Letter to 80s Teen Movies. He writes about music, books and movies for Salon, Buzzfeed, The Decider and NPR and has served as Educator in Residence at the SFWC since 2010. He lives in San Francisco with his wife and too many books and vinyl records and is in the middle of directing his first documentary film. 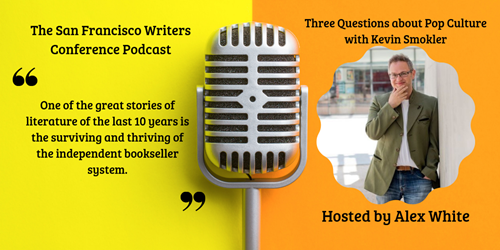 Listen in as host Alex White asks Kevin three questions about the publishing industry today. Lots of great insight.